The key, as Ubisoft sees it, is exploiting history's cracks, the better to create its fictional counterpart. "Any time we use historical characters or historical events, we try as much as possible to be objective and not bend history," says Ubisoft creative director for Assassin's Creed 3 Alex Hutchinson. "But any time we find cracks - areas that aren't reported very much, or days that aren't documented - we try to take those spaces." That's how Ubisoft sees history; as a bed for its fiction, not a straight jacket. There's no such thing as a static history, Ubisoft believes, and committing to one, set-in-stone interpretation would have been a mistake, both for the fiction and its historical context. "I think anyone who argues that history is objective or static is very confused," Hutchinson goes on to tell The Globe and Mail. "I don't think that there's a single event that hasn't gone through multiple interpretations or iterations in terms of what people believe even happened, let alone what was important about it, or what led up to it or what followed it." That's what Ubisoft exploits: the fluidity of historical interpretation, which allows it to play with the data and come up with a narrative that fits both the period, and the fictional imperative. Hutchinson goes on to remark that, particularly with the American Revolution, it helped Ubisoft that many people know very little about the period. Ubisoft's focus groups seemed to think that it was all about Billy the Kid's adventures with Christopher Columbus; not many of them even managed to get the century right. "It's depressing," Hutchinson says, "But it's also an opportunity: They don't know anything! We can completely come in and show you it's cool." There's no doubt that historical narrative is one of Assassin's Creed 3's major strengths, even when it drifts into speculative waters. 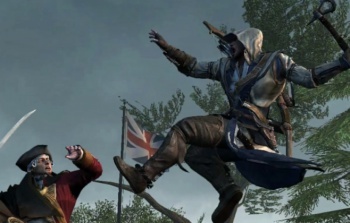 Ubisoft is forging ahead with its series; Assassin's Creed IV: Black Flag is the next on its list of historically themed stab-em-ups. We'll have to wait till later this year to see what it might have in store.